*I'll answer your inquiry very quickly, usually within an hour. **If you're ready to book now, please click on the 'Request to Book' button. If you'd like a quote, please click on 'Send Message' button. Privacy is what A LOVER'S HIDEAWAY is all about, tucked away in a natural park like setting against Bluff Mountain, located about 5 miles from downtown Pigeon Forge, approximately 8 miles from Dollywood and about 14 miles from Gatlinburg. Deep in the heart of the Great Smoky Mountains, A Lovers HIDEAWAY offers a loft king bedroom with a LCD flatscreen TV, a view of the treetops, and all the privacy you will need to celebrate your romantic getaway. Sit back and relax in the hot tub on your private porch or warm your toes by the woodburning fireplace and cuddle up. A LOVERS HIDEAWAY is a true log cabin with all the comforts of home, including a fully equipped kitchen and a flat screen tv in the great room. Location is super. . tucked away with privacy for relaxation but close to all Pigeon Forge has to offer! **If this cabin is booked for your desired dates, check out VRBO #367295, #369981, and #617953, they are all 1 Bedrooms just like Lover's Hideaway in the same area. My husband and I live in East Tennessee and love the Smoky Mountains. We have several cabins and enjoy sharing them with our guests. We love Bluff Mountain where all our cabins are located. We thought this cabin would be perfect for honeymoon or anniversary couples, or those just wanting to get away! A LOVER'S HIDEAWAY is tucked away from it all in the mountains, but still within minutes of everything on the Parkway! Wood burning in great room - we do not provide wood. We enjoyed our stay at A Lovers Hideaway! It was secluded yet close to all the activities. It was very clean and comfortable. We will definitely be back! My husband and I spent our one-year anniversary in March at Lover's Hideaway and it was absolutely wonderful. 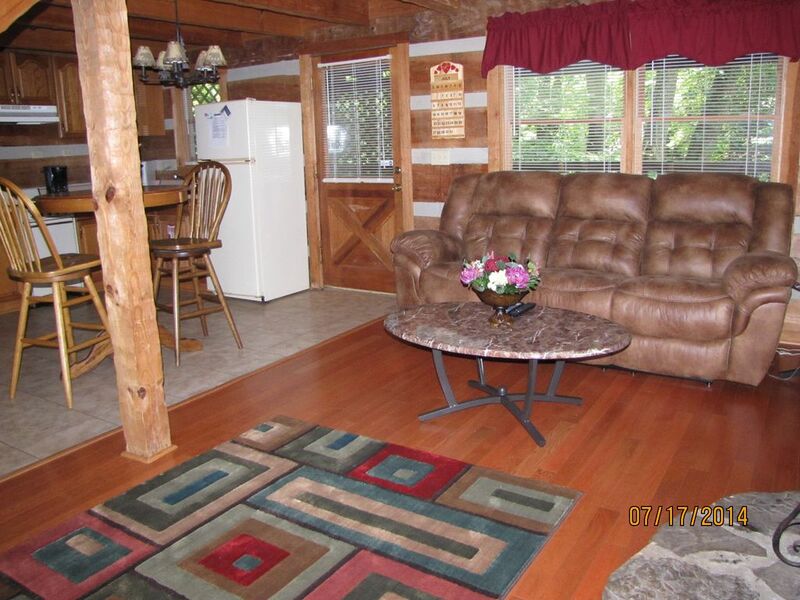 The cabin is very nice and cozy for a couple looking to get away together. We enjoyed our time in the private hot tub, but the Jacuzzi tub did not work unfortunately. The bed is super comfortable and having a bath and a half was very convenient as well. We will be back to stay in this cabin for future anniversaries! We loved it... will definitely go back!!! Cabin was great!!! Could not get jacuzzi to work but we didn’t mind. Would definitely recommend! This is our 3rd time renting this cabin and won't be the last. We love the location tucked back in the hills and the privacy. Cabin is always clean. The only thing that was annoying was squirrels or something like that scratching on the ceiling at night. It sounded as if they might come thru the roof. But everything else was wonderful. Could not ask for more . Clean well maintained . Holiday touches . Wish we could have stayed longer . Owner quick to respond on snags . Wish we lived closer , would use it often .